Hannah Genders on how to care for your garden during August. Deadheading: Annuals provide some colour in the border at this time of year, as the cottage garden perennials have largely finished flowering by the end of June. Planting a few annuals like cosmos give the perennial borders some extra colour before the later flowers of the sedum and asters come out. Any annuals need dead heading to make sure they keep flowering; just pinch out the flowers on a regular basis as soon as they have gone over, and then the new buds will come out. Pots: I love pots! 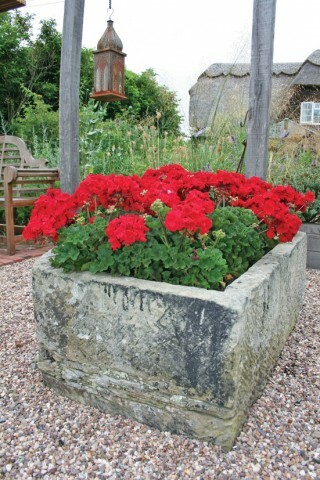 Pictured here is an old trough we found in our garden when we bought the house – we had to move it with a digger, but now each year I just fill it with red geraniums. For me, one or two colours work best for summer pots. The flowers again need deadheading regularly and with geraniums you should remove the whole flower stalk back to the base to keep the plants tidy. Any pots will also need feeding, particularly smaller pots; once the plant has grown up and filled the pot and then flowered it has taken a lot of nutrient out of the soil or potting compost. You can either feed with a foliar feed (this means through the leaves), which is added when watering, or a slow-release pellet feed which can be bought at good garden centres and will usually last the whole season. Pruning summer shrubs: large shrubs like Philadelphus, Spirea and Weigelia have now finished flowering and benefit greatly from a summer prune. August is the ideal month to do this, and the result is a neater shrub and better flowers next year. All these shrubs flower on the new wood, so the pruning technique is to trim back the old branches that have just flowered to the new growth (which will be flowering next year). If the plant has become leggy and too tall, cut back to the lowest branch of new growth. Using sharp secateurs, trim to just above the growth point of the new branch. If there are some very old branches that overcrowd the shrub, these can be removed to ground level to tidy up the plant – but only remove up to one third of the shrub in total, and it’s a good idea to keep standing back and checking the overall shape. Once you have finished the pruning the shrub should be reduced in height, less congested and will flower well next year. Watering: an obvious one really as August is one of our driest months. Try using rainwater as much as possible when watering the garden and pots as its much more sustainable and has fewer chemicals than tap water. If you don’t have a friendly neighbour to enlist for help while you are on holiday to help with watering, an irrigation system is a good idea. They are easy to install from an outside tap and can be set to come on once a day, a full system for about 40 pots will cost around £50 and can be used again and again. The Vegetable Garden: watering is probably the most obvious thing with your vegetables and regular watering is very important – beans will still be coming thick and fast (hopefully) and need to be kept as moist as possible, and the greenhouse will need regular watering. It is vital to water tomatoes about the same amount each day, as erratic watering will result in the fruits splitting and although they will still taste good, they look unappetising. As with pots, the tomato plants will need regular feeding – this can be done with a watering can and a specialist tomato feed which is added to the water about once a week. Tomato plants also need the side shoots removing to encourage the plant to put its energy into the fruit rather than growing leaves. The side shoots grow between the leaf node and the main stem and are easily removed with a finger and thumb. If the plant has put on lots of leaf growth, I often remove the lower leaves to let the sun get to the ripening fruit. Collecting seed: Many of your favourite flowers may have finished, but they will be setting seed and this is the ideal time to collect them. Plants always grow best from fresh seed, whether perennial or annual, it’s also a good time to collect wildflower seed from a meadow before the grasses and flower heads are cut back in September. Store the seeds in a cool, dry place out of direct sunlight and label them clearly, as it is so easy to forget by next spring what seed you harvested! Relax: we spend all year in our garden doing jobs – this is the month to sit and enjoy it.